Do you have a plain old mirror laying around? Well if so, today’s tutorial is perfect for you. My sister gave me this plain beveled mirror when she was cleaning out her condo before moving. Since I am a sucker for hoarding anything I can DIY with, I happily added it to my stash… where is stayed for a year. 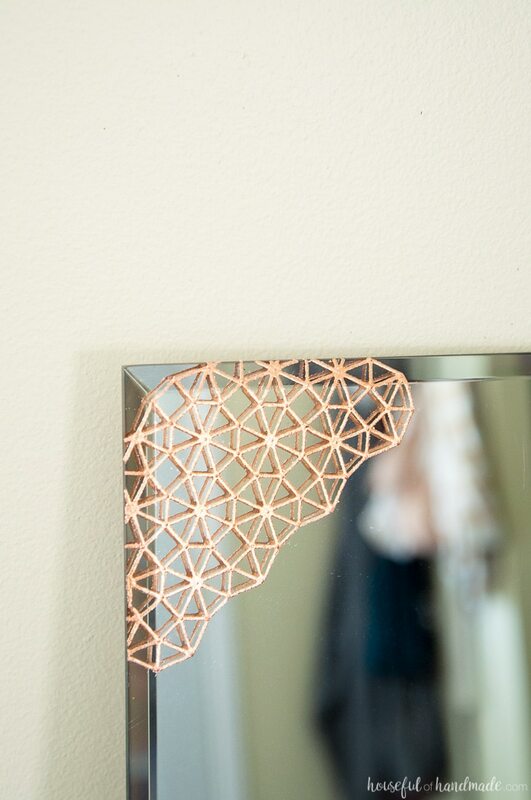 But not anymore, now my DIY copper mirror is happily displayed on my dresser for everyone to see. I have been seeing metal accented mirrors all over lately. I love the look of the metal with the mirrors. But I am too cheap to buy them. 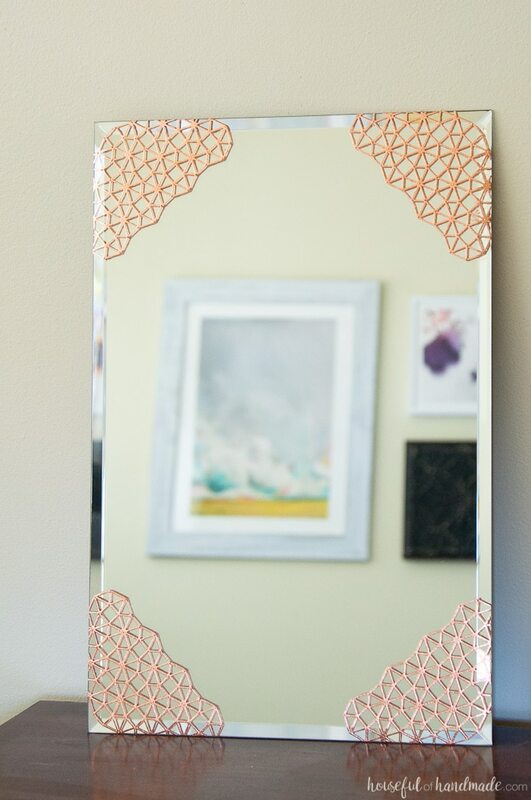 So when I saw these new dies by Lena Lok from Spellbinders, I immediately knew they would be perfect for adding a metal accent to my hand-me-down mirror. I decided I wanted to add copper to my mirror. Why copper? Because I am in love with copper, especially once it starts to patina. So I set out to find a way to get that coppery goodness on my mirror. And I found it with real copper leaf sheets. Since they are made of real copper, they will also patina over time. Yeah! Now I had my design, my copper and my mirror. Time to get to work! This project was so easy, but does take a little bit of time. The copper leaf is very thin and you have to move slowly to apply it and then to remove the excess. It was actually really therapeutic to brush away the excess copper. Even my daughter got in on the action. I told her we can get her own mirror and add some copper to it so she can do again. 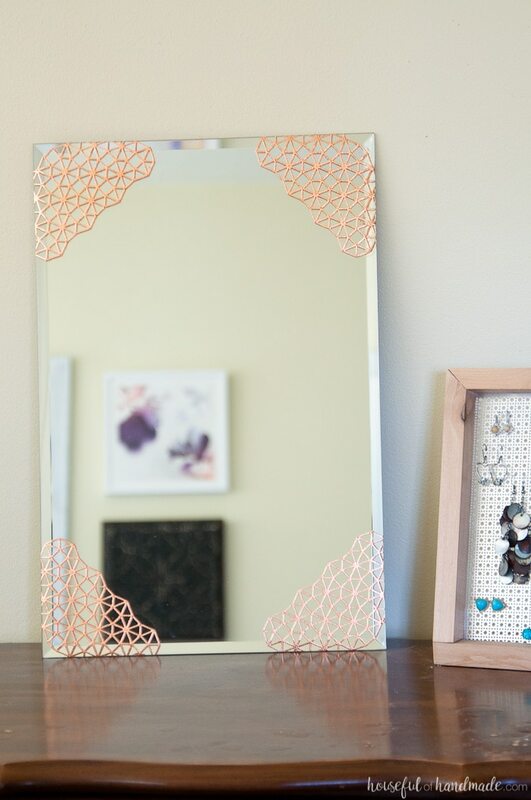 And I am loving my bling, bling DIY copper mirror. It’s perfect on my dresser next to my DIY earring holder. It makes the perfect place for me to get my own bling, bling on. Maybe I will even start to wear earrings again because of it! 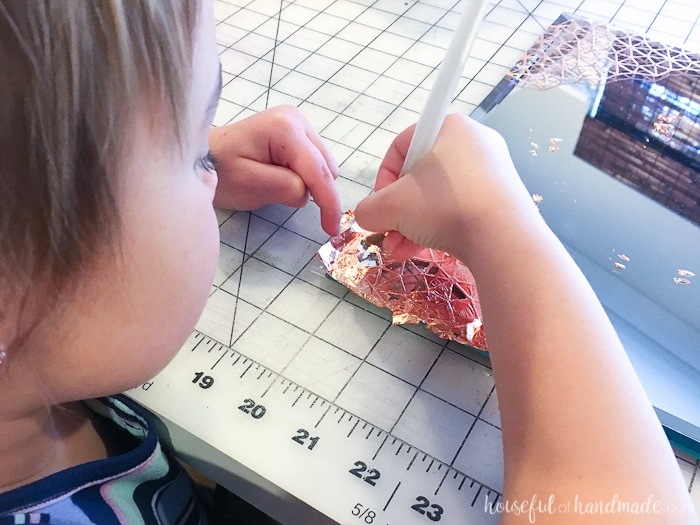 If you want to see how to make your own DIY copper mirror. Click on the arrow below for the full tutorial. This SpellBinders cutter is so cool! I’m always amazed by what you can cut with it, and this project you did does not disappoint. It’s the perfect accent to your mirror! It looks so beautiful! 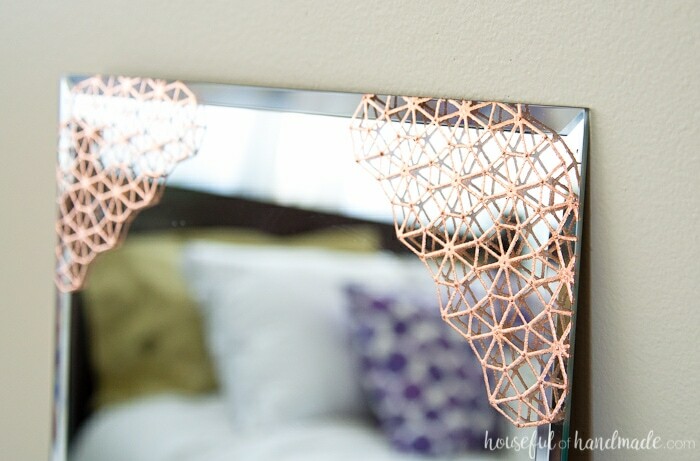 What a fun detail to add to a mirror!